This deck take some inspiration from another deck i've come across. 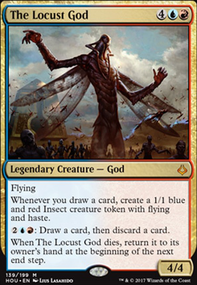 The goal is go get The Locust God out along with Niv-mizzet Parun, get a couple insect tokens going, then use skull clamp to draw cards to create more tokens and deal direct damage to a player. Ideally you'd have Alhammarret's Archive and Kindred Discovery on the battlefield to increase the number of cards drawn and damage dealt. And yes, the mana count is super low (that was part of the tweaking process) I'm getting more lands added to it this week. I also have 2 cards I can substitute for lands in for. Otherwise, to buy time (other win conditions) get a Reliquary Tower out to increase your hand size and pick up the two creatures whose power is equal to the number of cards in hand. you can also use Burning Anger to deal damage based on card size. Otherwise, normal win conditions would be to knock them out with creatures, small direct damage, and creature control.